Friends of Guest House resident Helenia Bragg knows the importance of second, third and even fourth chances. Bragg, 61, spent 20 years in jail and has struggled with substance abuse since her teenage years. But a light bulb went off for the Alexandria native while she was incarcerated for the fourth time, and after being released from jail in 2015, she has worked to turn her life around. Soon, she will graduate from Marymount University with a bachelor’s degree in social work. Now, she wants to give back to women who, like her, are looking to get back on their feet. Bragg was born and raised in Alexandria. She and her brothers were originally raised by their grandmother who, Bragg recalls, took them to church and tried to instill the golden rule in them. Then came Bragg’s pre-teenage years when she moved into her mother’s house. At first, Bragg was dazzled by the materialistic things she had never had with her grandmother – her own room and Jackson 5 records – but she soon realized these items came with a price: Her mother illegally sold alcohol from their house when liquor stores were closed. “There was a lot going on, especially on the weekend, in the house: a lot of dysfunction, a lot of drinking and violence,” Bragg said. Mary Cross, who watched Bragg grow up, described the relationship between Bragg and her family as “traumatic,” and said it was no surprise to her that she spent time in jail, given her rough upbringing. By the time she was 18, Bragg was already serving her first prison sentence: a year and a few odd months for drug possession. She developed a daily drug habit early on. Though Bragg had aspirations of becoming a flight attendant and starting a family, her issues with substance abuse made that dream unfeasible. “I think I probably had the basic childhood intentions of getting married, having a kid, having a house with the picket fence and the car, but once you become addicted to drinking and drugging, nothing else is important,” Bragg said. In between her last two prison sentences, Bragg worked as an electrician for B&B Electric. She was doing electrical work at the Harris Teeter in Foxchase when she experienced a relapse that would put her in jail for the fourth time. “When I relapsed that made me feel worthless. … It killed my self-esteem and my self worth. I felt like I was just meant to be an addict and a drunk and a crook and that was what I was put here on the Earth to be, but now I know that was just the disease of addiction talking to me, telling me that I was worthless,” Bragg said. During her fourth sentence, Bragg said, she had an epiphany. “The light bulb was that when I drink and drug I commit crimes. When I drink and drug I go to prison. … It seems so elementary. It doesn’t seem like a lesson that you will have to learn. It will appear to be clear-cut to the average person whose mind is not hijacked on drinking and drugging. Because it is so fundamental: drink, drug, get in trouble, go to prison. Don’t drink, don’t drug, have a successful life. But, hell, it took me four times of going to prison, 50 years old, 40 years of addiction to get that wake-up call,” Bragg said. Once Bragg came to that realization, several institutions were there to help her turn her life around, both during her time in jail and after her release: the Fluvanna Correctional Center, Piedmont Virginia Community College, Howard and Marymount universities and Alexandria’s Friends of Guest House. During her incarceration, she worked for Fluvanna Correctional Center, teaching others how to deal with substance abuse, which she said also helped her learn strategies for herself and how to set a good example. During that time, she also took classes from Piedmont Virginia Community College that would lead to her receiving the Sunshine Scholarship. The scholarship program, started by Doris Buffett, the older sister of philanthropist and billionaire Warren Buffett, gives money to women who show aptitude for their studies while in prison, allowing them to attend college. Education had never been a passion for Bragg, who was discouraged and embarrassed by her inability to even understand the textbooks for her classes. This changed while she was in prison, while she worked toward her associate’s degree. “It made something in my mind click. Instead of me craving the drug, I began to crave education; I began to crave facts and I wanted to understand the function of politics and I wanted to understand the elements of science and nature,” Bragg said. After completing her last prison sentence of 10 years and 8 months, Bragg considered what to do next. When she was young, watching the students come and go from her perch atop the walls of Howard University was a favorite diversion of Bragg’s. Howard University was thus her natural first choice when searching for the next step in her education and in 2016, a year after her release, she was admitted. After realizing that Howard only accepted 43 of her 60 credits, she later transferred to a Virginia college, Marymount University, that took all of her credits. Bragg was also in need of a job. While attending Howard, she noticed how the bathrooms and classrooms were “unkempt.” She took pride in her education there and wanted to help make the learning environment neater for herself and fellow classmates. However, when she applied to the cleaning service there, they rejected her on the grounds of her criminal history. “So you mean to tell me that I can get financial aid and pay my money to go to this university but I can’t clean it up?” Bragg said. Education may have been the spark that motivated Bragg to end her addiction, but she lacked the necessary resources to physically manifest her new outlook. This is where Friends of Guest House came in. Kari Galloway, executive director of Friends of Guest House, said the non-profit’s primary goal is to support women who have been incarcerated and help them re-enter society. The organization, which is one of only a handful of transitional facilities for women in Virginia, has a strong track record of helping women avoid recidivism. “There are people who just want to define you by your least proud moments in life, right? And we’ve all had least proud moments, but if we all had to wear a scarlet letter, if we all had to wear a t-shirt with our least proud moments, none of us would have a job or a house,” Galloway said. Originally, Bragg’s parole office wanted her at a halfway house in D.C., but they did not have a bed for her when she was released from prison. Bragg filled out the eight-page application to stay at Friends of Guest House that includes providing information on health, support systems and goals for the future and participated in a phone interview. Upon hearing no response, Bragg was not discouraged. She saw staff at a re-entry fair in 2016 and expressed her interest in joining the program; her admittance quickly followed. That initiative speaks to Bragg’s personality and drive, Galloway said. “She is a really good self-advocate, she’s a very determined person and she knows herself, what’s in her best self-interest,” Galloway said. At Friends of Guest House, in exchange for a bed, food and utilities, women work through a rehabilitation program. Galloway said Bragg took full advantage of this. “Anything that was offered to her, she tried it. If it was to go to tango classes she did it. If it was to participate in another really great program called ‘Back on my Feet,’ which is a running program for homeless people, she tried it. 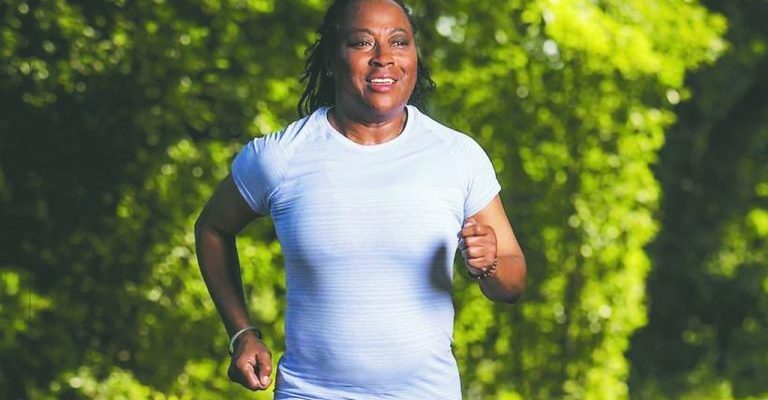 She’s 61 years old and she had never run before, but she was out there every day running and encouraging the other women to do the same thing. She’s very very good at getting people to do things that are in their best interest,” Galloway said. Through Back on my Feet and Friends of Guest House, Bragg was connected with a transitional home for juvenile girls in Washington D.C., where she works as a house monitor. “I share my story with them and I try to convince them that you can stop. Anything negative in your life, at anytime you choose to. You do not have to continue on the path of self destruction,” Bragg said. Once Bragg had a support system and a job, she was ready to start dreaming about her future again. Bragg has big plans for after she obtains her bachelor’s degree at Marymount, where she’s majoring in social work and minoring in history. She hopes to start a nonprofit that will aid women who have earned vocational skills while incarcerated and who have “changed their mindset and started the ball rolling in their future,” in finding a job. Bragg knows firsthand the difficulties of finding a job after prison and seeks to remedy this. “If you have a training, a skill in a certain area, then you should have the opportunity to apply that when you’re released,” Bragg said. Women who work to better themselves and to get an education during their time in prison do so to utilize their new skills for their eventual release, Bragg said. When no one will accept them, Bragg continued, it is disheartening. “So many of my friends have become frustrated and they end up drinking, drugging, going back to sugar daddies, going back to shoplifting,” Bragg said. Her proposed future business, SHE, which stands for “Seeking Higher Employment,” endeavors to be the missing link between qualified ex-felons and jobs that will enable them to live new lives and avoid being arrested again. Her program would be centered on giving back and connecting women with jobs relevant to their qualifications. In exchange for board, transportation and other resources, beneficiaries will give 10 percent of their gross income back to SHE to provide the next generation of women with similar opportunities. “I’m not going to have a big fancy office somewhere on Eisenhower Avenue or Old Town. Heck, I might have a closet in the social services building, I don’t know. I just need a telephone and computer and get out there and make connections with business owners, make connections with human resources and companies and corporations and convince them to give these women a try, give these women a chance,” Bragg said. Bragg chose to focus on women because she knows the importance of having a safe and sheltered environment for recuperation, free from the threat of domestic violence or substance abuse. Women face unique challenges during incarceration, many of which Bragg has experienced. She said one difficulty is the cost of personal hygiene items, such as tampons, that are sold for up to $12 to inmates. For someone who earns a mere 23 cents an hour and $30 a month, a typical inmate salary, half of their income must go to basic necessities. Bragg said men do not have their prison incomes depleted in the same way. Another time, Bragg said, the warden confiscated all the women’s makeup products and the inmates turned to fashioning their own lipsticks from skittles. “I find that’s a challenge to women in prison – to keep their femininity and to feel good about themselves,” Bragg said. The majority of U.S. states imprison women at far higher rates than do most other countries. The top 25 incarceration rates in the world are all individual U.S. states, with West Virginia topping the list on a percentage basis. The U.S. imprisons women at a rate eight to 25 times greater than other NATO countries, according to prisonpolicy.org. “Mass incarceration is out of control in this country. And to look and to visit with somebody like Helenia is to understand that we have to do something to change that,” Galloway said. Bragg, for her part, is working toward being an example of what rehabilitation can look like. “Now I live in this beautiful recovery house and I think it’s important that we realize that anything is possible as long as you are drug free, open for suggestions and willing to work hard,” Bragg said. Link to original article on the Alexandria Times website here.